Review Summary: On the whole KABUL EXPRESS is aimed at the elite and the thinking audience. On the whole KABUL EXPRESS is aimed at the elite and the thinking audience. If debutant director Kabir Khan wanted to give the innovative cinema buff a taste of exotica he somehow succeeded. Experiences of journalists covering war or conflict zones have produced great movies like The Killing Fields and The Year of Living Dangerously, and all Bollywood can come up with is a trivial Kabul Express. George Romero's Night Of The Living Dead ended with the scariest scene of all -- human beings have won the battle against zombies and are now rounding them up like mad dogs, shooting them in the head and burning them on a pile of dead bodies. A kid can't play like others. He doesn't have a leg. But that smile on the face clearly enunciates that he doesn't expect anything from life except some normalcy. Maybe a Hindi film song is his definition of normalcy. 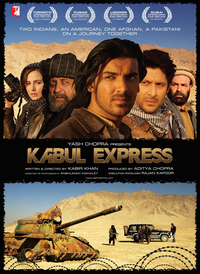 Kabir Khan's 'Kabul Express' is a film that extracts such vignettes of implausible possibilities in the war torn Afghanistan where voiceof-reason is riddled with a stream of bullets. And yes it also tell you that if you are the driver of a truck loaded with Pepsi cans (a symbol of American liberalism) then be ready for a bullet in the head. The lighthearted bantering throughout the course of the film, exceptional camerawork by Anshuman Mahaley and a tight two hour length makes this a gripping fare all the way. A very different story well directed by Kabir Khan it is basically not meant for Bollywood it is meant for the international audience. It is surely going to get very good appreciation abroad and is surely going to bag few awards.